A semi-private cabin nestled in the trees, Kandy Kisses has all the amenities you’ll need for a relaxing couple’s getaway: an indoor jetted tub, an outdoor hot tub, a gas fireplace, and rocking chairs overlooking wooded/creekside views. 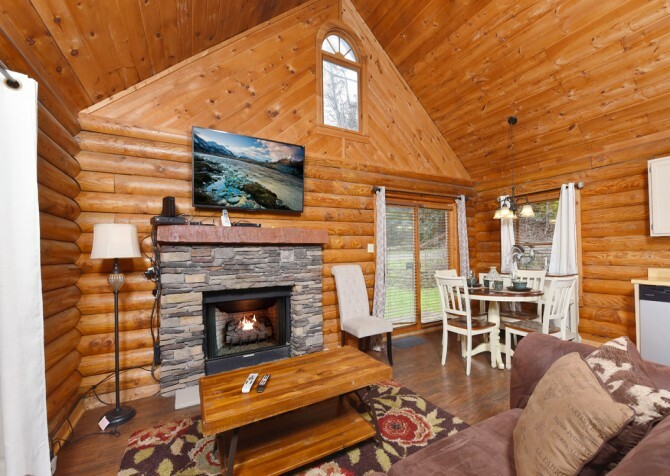 It's the perfect place to slip away for relaxation, romance, and reconnecting! 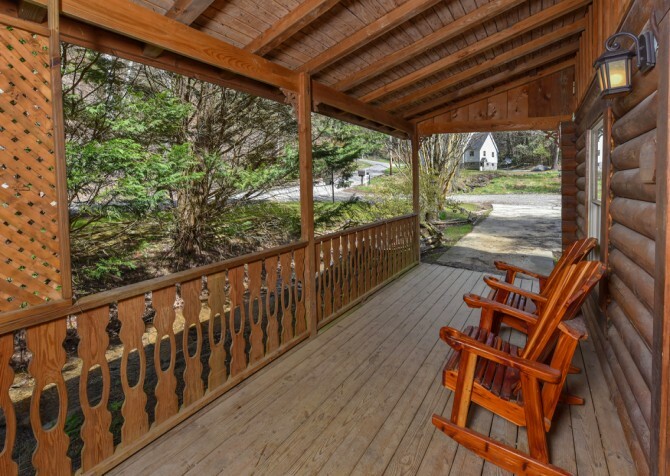 Sit back and listen to the rolling creek on the shaded rocking-chair porch before taking the short drive to the heart of downtown Gatlinburg for dining, shopping, and fun! 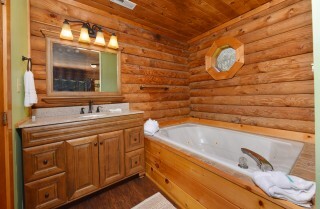 Couples’ activities are endless in the Smoky Mountains. 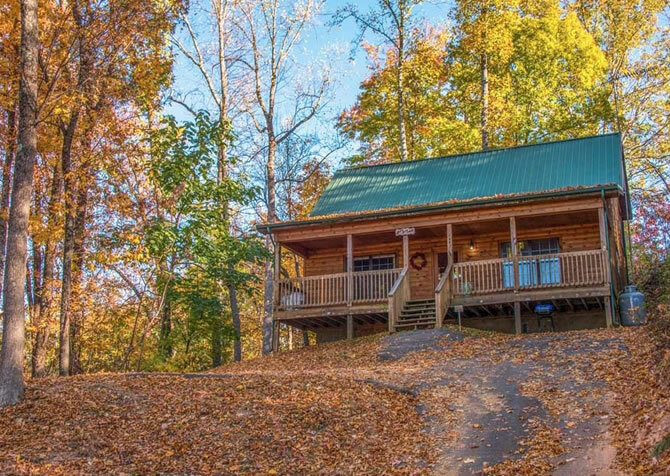 From golfing at one of the most scenic courses in the state of Tennessee to experiencing a Gatlinburg Ghost Tour, you’re sure to find exciting ways to spend your days while you’re on vacation. 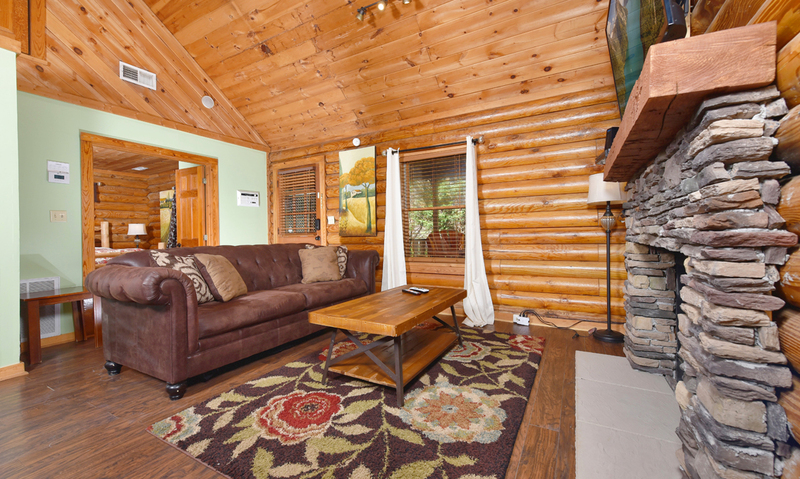 And when you’re ready to kick back and relax, simply head to your living room inside Kandy Kisses. This cozy living space features everything you need for a relaxing night with the one you love. 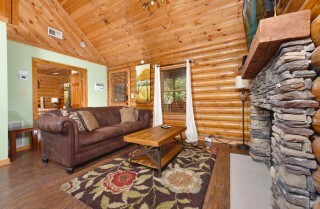 Enjoy a large leather sofa, where you can curl up with a blanket and a favorite book. Or turn on the gas fireplace, pour 2 glasses of bubbly, and enjoy a romantic evening on the couch. There’s also a big screen TV with a DVD player—perfect for watching those old favorites you brought with you or any new releases you picked up from Redbox. 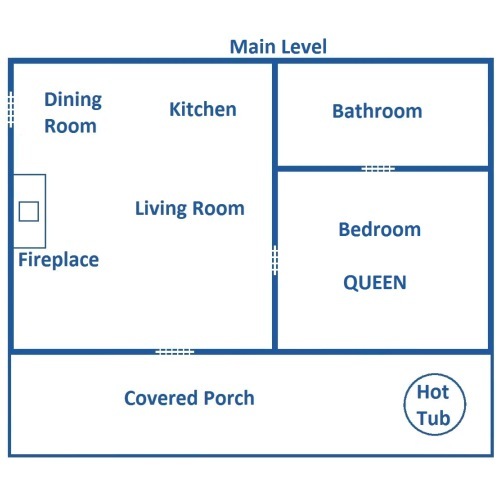 If you’re looking for something fun, try a game of cards or a board game on the coffee table instead. 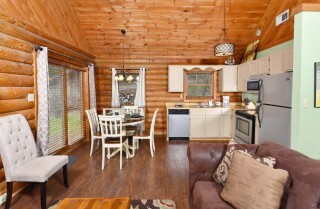 The Kandy Kisses living room provides plenty of options for enjoying a quiet night inside the cabin. 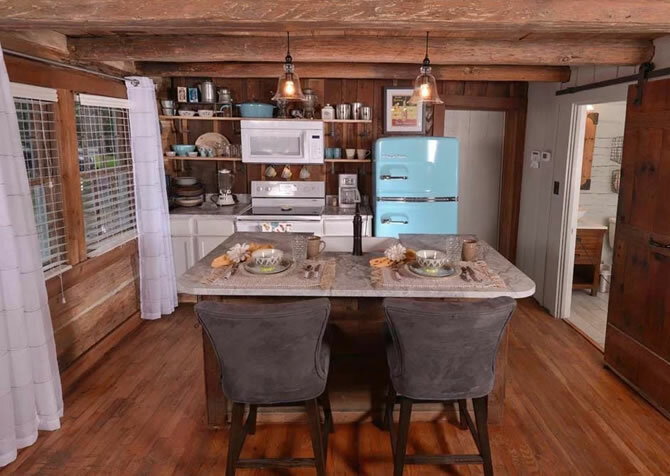 The white cabinets and mint green wall color inside the Kandy Kisses kitchen stand out perfectly against the all-wood interior of this cabin. 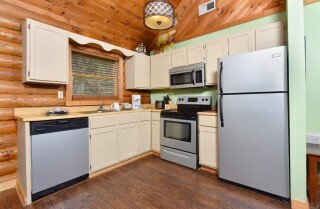 For meal prep and serving, this kitchen provides all your major appliances as well as all the cookware you will need. You can plan for pancakes for two in the morning, an easy picnic lunch while you go birdwatching in Gatlinburg, and a homemade dinner at your private dining room table. 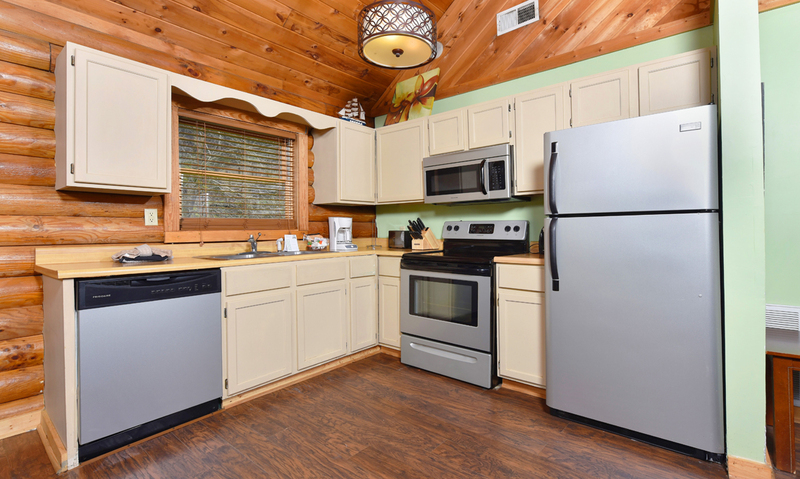 The Kandy Kisses kitchen also comes with convenient extras like a coffee maker, knife set, and more. Be sure to stop by a local grocery store or the nearby Wears Valley Farmers Market on your way to the cabin and stock up on all your cooking essentials. 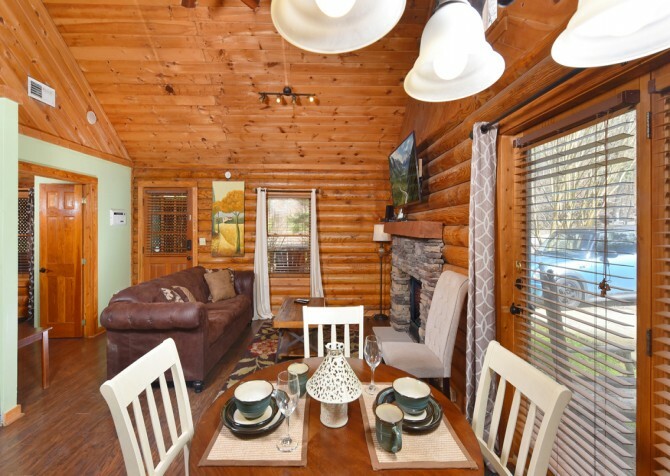 Enjoy a memorable date night in the cabin with the dining room inside Kandy Kisses. You can plan for an in-cabin massage, a romantic meal for two delivered to your cabin door (ask our reservation specialists for more information), and a private dining experience that you can’t duplicate in any downtown restaurant. 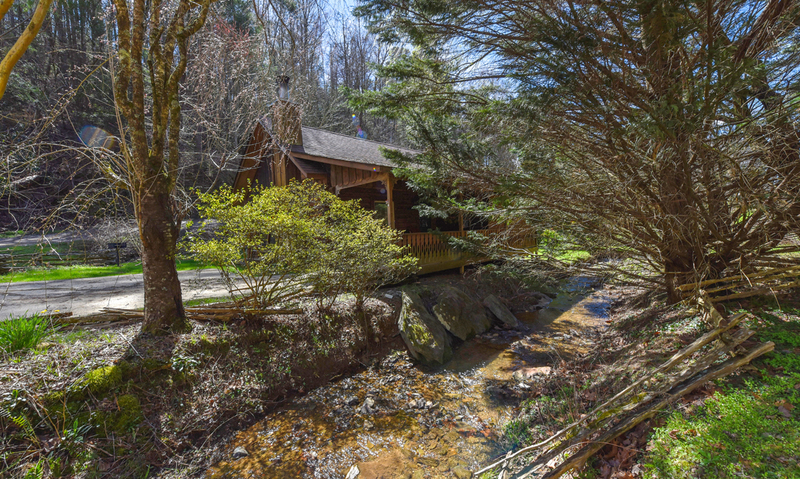 If you do want to get out and enjoy all that Gatlinburg has to offer, try a fun date to Ripley’s Aquarium of the Smokies instead. 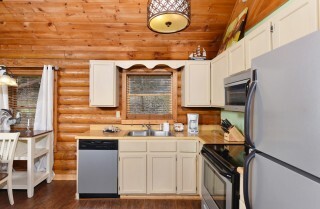 Then head to a Gatlinburg restaurant that offers carry out and opt to take your food back to the cabin. 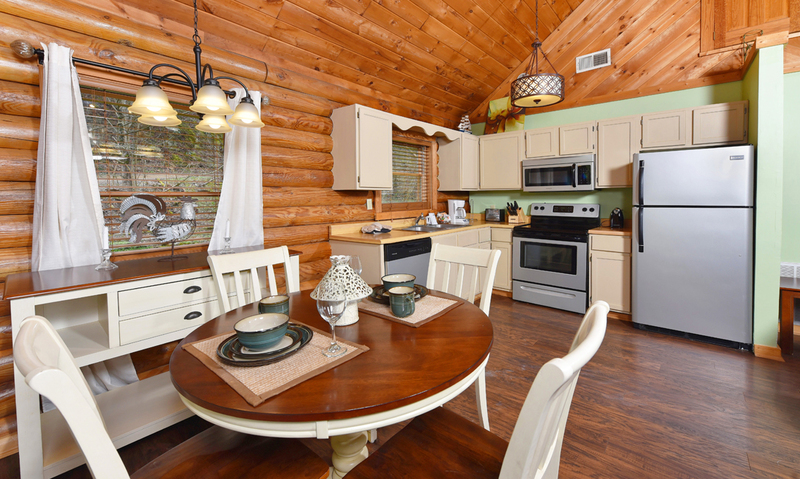 You can enjoy a delicious dinner at your 4-piece dining set with stunning views of the Smoky Mountains right outside the large glass doors. 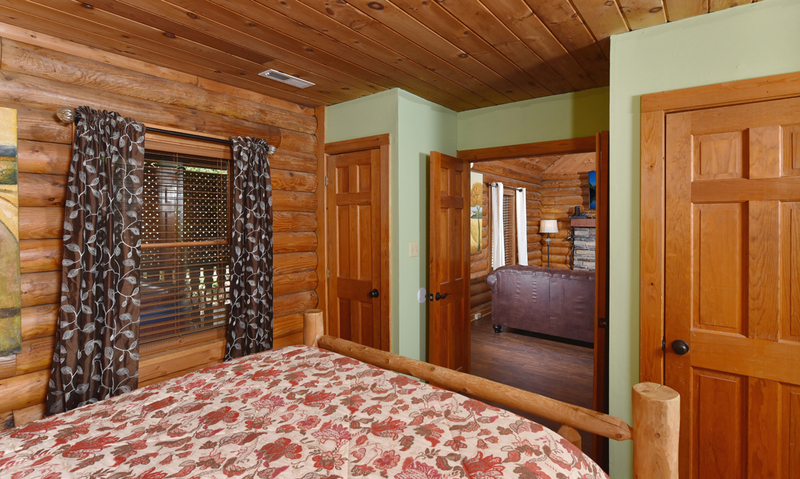 A romantic paradise in the Smokies isn’t complete without the perfect bedtime escape. Kandy Kisses offers just that with its single bedroom featuring a queen-size, log-style bed. Double doors lead you into this cozy space, where you’ll find a reading lamp, two side tables, a large window, and direct access to Kandy Kisses’ updated bathroom. The beautifully decorated bathroom features modern cabinetry and overhead lights as well as one of the best features of the whole cabin: an indoor jetted tub! Take advantage of this amenity as a place to unwind in the evening or rejuvenate in the mornings. One of the first things you’ll notice as you park your car on Kandy Kisses’ flat paved driveway is the beautiful rocking-chair porch, where you’ll love sipping your coffee in the mornings or your sparkling cider at night. The rocking chairs sit beneath a sloped roof that extends past the railing, so you’ll be able to enjoy the outdoors rain or shine. And they face one of the prettiest features of this property: a gently rolling creek. 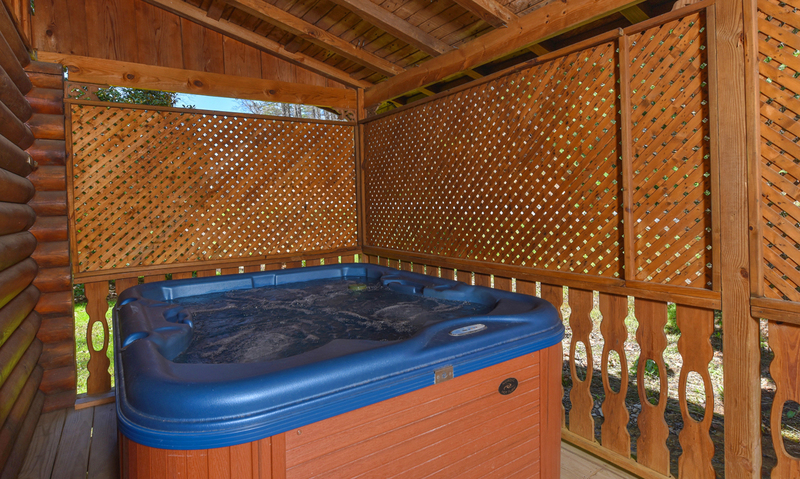 If you want even more ways to enjoy the great outdoors during your stay at Kandy Kisses, simply stroll to the back corner of the porch, where you’ll find an outdoor hot tub surrounded by a privacy screen. 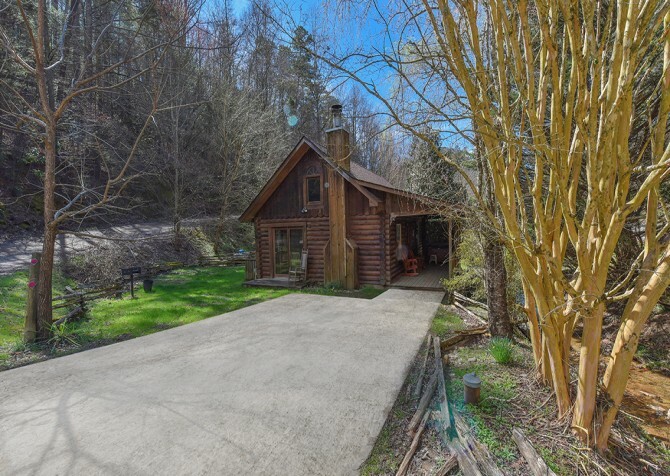 Be sure to bring your bathing suit and get ready for a relaxing soak in the Smokies during your stay at this semi-private cabin. Kandy Kisses is ideal for honeymooners, couples celebrating special occasions or anniversaries, or couples looking to get away. 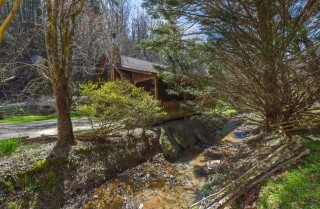 Or you can just get away with a friend for a rejuvenating hikers’ escape! This cozy cabin has more than enough space for 2 guests and features plenty of convenient amenities like an easily accessible interior (all on one floor) and a pet-friendly interior. 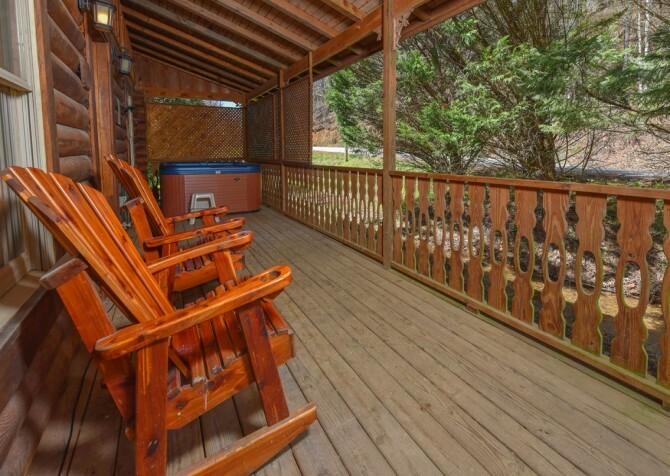 That means skipping out on kennel fees and letting your furry best friend join in on the fun of the Smoky Mountains this year! Besides all this, enjoy a CD player, VCR, DVD player, and high-speed Wi-Fi inside Kandy Kisses. 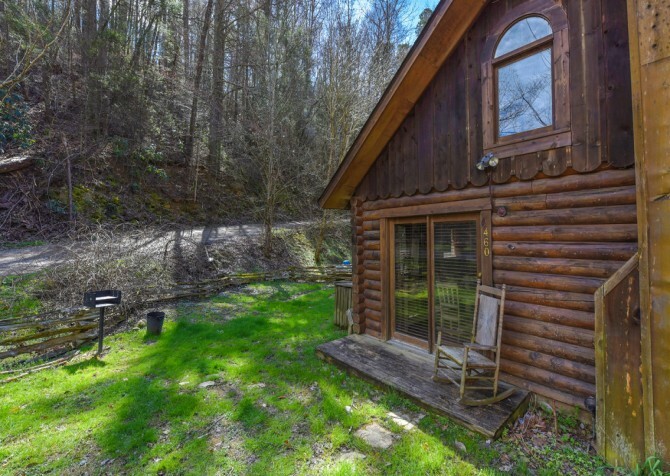 The internet access will definitely come in handy when it comes to researching where to go, where to eat, and what to do while you’re in Gatlinburg. 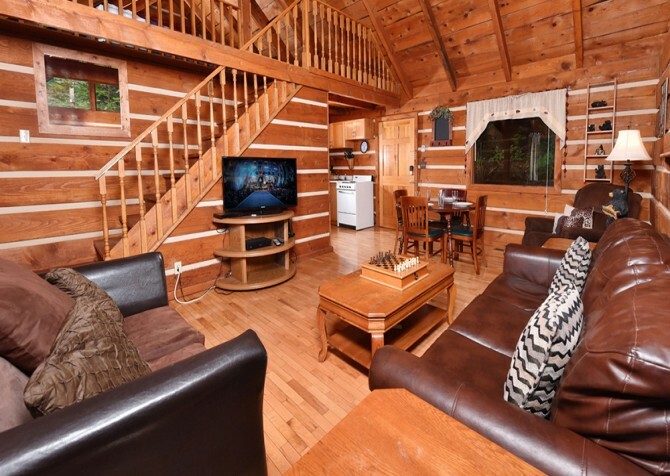 If you don’t feel like doing the research yourself, then simply keep up with our Cabins For You blog, and we’ll keep you updated on everything you need to know! 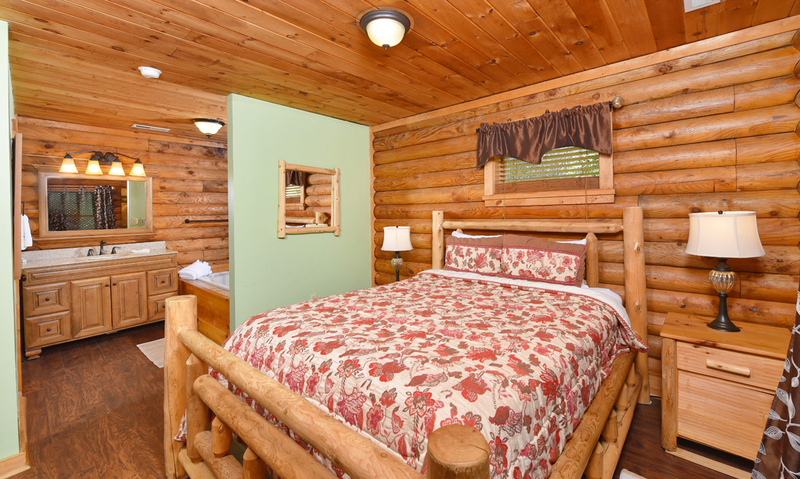 With so much to do in Gatlinburg, it’s no wonder couples choose this exiting destination for their honeymoons and other special occasions. 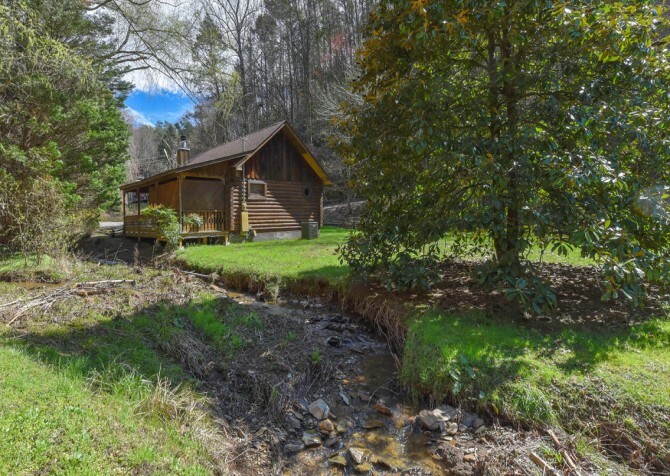 You can go on a wine tour, walk through the Great Smoky Arts and Crafts Community, take a horseback tour through the Smoky Mountains, and so much more! As Gatlinburg’s only musical comedy entertainment attraction, the Sweet Fanny Adams Theatre is a great choice for a fun-filled date night downtown. You can find this theatre less than 5 miles from Kandy Kisses, just around the corner from Ripley’s Aquarium. 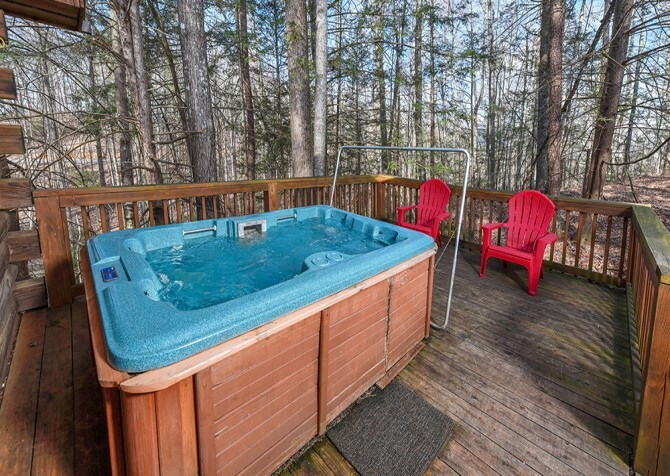 While Kandy Kisses offers impeccable views of the Smoky Mountain woods and a rolling creek, the Gatlinburg Sky Lift is a great choice for seeing the full grandeur of the mountains! 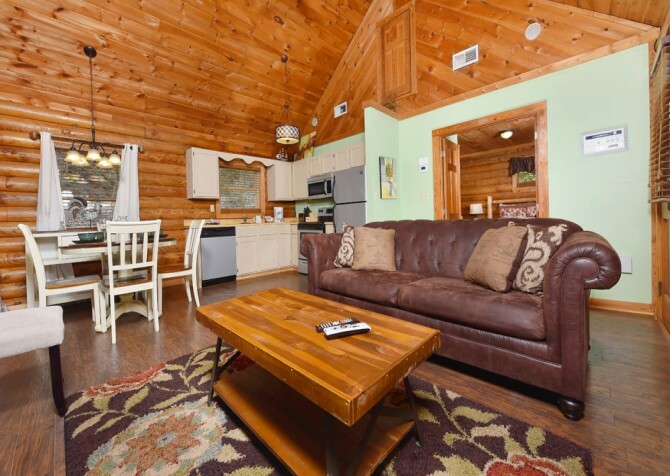 Not only is Kandy Kisses close to Gatlinburg attractions, but it’s also less than 7 miles from the Great Smoky Mountains National Park. Plan for a romantic drive around Cades Cove, a pleasant walk through the woods, or a picnic in the park during your Gatlinburg stay. "It was an absolutely amazing stay very secluded in the woods. We had such an amazing time. It was very close to everything. We will definitely be coming back." 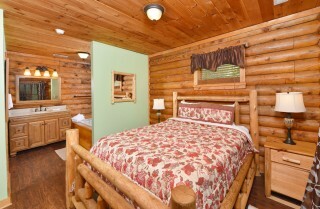 "My wife and I stayed at Kandy Kisses in Gatlinburg, TN. 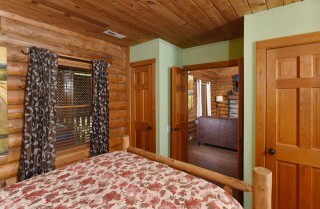 It was a beautiful cabin, and it exceeded all our expectations. We would definitely stay in this cabin on our next trip to the Smoky Mountains or another cabin by Cabins For You. It was a great vacation. Thank you so much!"